Right on the Walls is a vinyl decal company that not only offers phrases and graphics decals, but they also offer custom orders, personalized decals, wall clocks, and even monogram or name decals for a wedding reception dance floor and other wedding decals! They have a huge selection and offer designs I have never even seen before. I had never thought about decals for education/classroom, businesses, or even a wedding before, but Right on the Walls does all of it! 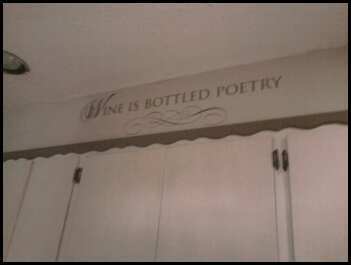 I picked out the decal "Wine is bottled poetry" because I want to have a wine theme in our kitchen. We already have some wine decorations and a huge wine rack in the dining room, so I wanted to put a decal up in the kitchen to expand the theme there too. I was very impressed with how smoothly the decal went on and how fast I applied it. There were no air bubbles or any problems with it at all, and it seemed easier to put up than other decals I have applied. 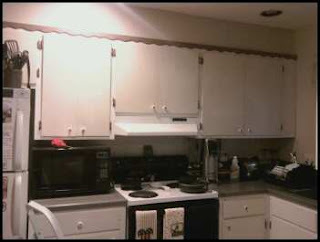 I love the way it turned out, it looks elegant and adds interest to our once-boring kitchen. 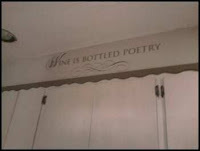 Right on the Walls has so many designs that I thought were awesome and it was really hard to choose, but I am very happy with the wine phrase decal that's in our kitchen and I would definitely get more decals from Right on the Walls in a heartbeat! Buy It: You can purchase decals online at RightontheWalls.com. 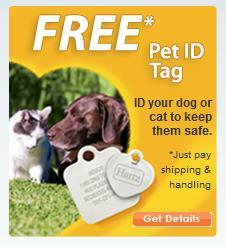 Leave a comment for each entry and include your email address. Mandatory Entry: Tell me which decal you would choose if you win! Leave a separate comment for each entry. Contest Details: Giveaway will end on Tuesday, October 5 at 11:59 pm (CT). Winner will be drawn via number generator Random.org. Winner will be contacted by email and will have 48 hours to reply before a new one is drawn. Disclaimer: I was given an ROTW decal free of charge for the purpose of this review. All opinions are my own experiences with the product. Individual results may vary. No other compensation was given. I would choose Busy Branch w/ 2 Birds. I'm a sucker for nature themes. I "liked" them on Facebook! I am IN LOVE with the 8' Tall Birch Trees + Birds With Custom Carved Heart... BUT since that is $155.95 (Yes, I have exquisite & expensive taste. lol) I guess since I only have $40 to dream with I would pick the little 'Bird in Cage' design for my daughters room. I also LOVE that Headboard Floral Design. I "liked" your site on facebook! 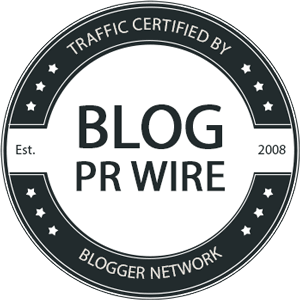 Already have your blog button on my blog. Is it okay for me to keep entering w/ things I have already done? Going to tweet this right now! I entered the wallet giveaway! I entered the shower curtain giveaway! I also entered the All-Ett Wallet giveaway. I entered the jeans giveaway! I entered the lip stuff giveaway! I also love the nature themes! Look great to spruce up a room! just "liked" you on facebook! entered a contest yesterday, and 2 others today! I would get the School Of Fish for my bathroom. "Make each day a story worth telling." That's beautiful! Sometimes I Put It In The Food. :) I would totally pick that one! I also follow through emails! I signed up for the Little in the Middle Jean giveaway! I'd pick out the ice skater decal!! I would pick the Floral Mix decal. 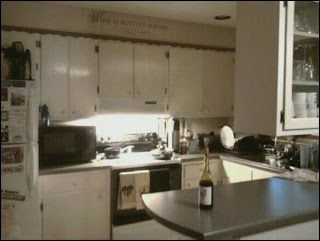 I would love, "May this be a place of happiness and health, creativity and kindness, blessing and peace" for the kitchen!! I liked Right on the Walls on FB. I liked you on FB!! I entered your Azuri scarf giveaway! I entered the ShaToBu Toning Shaper giveaway! I'd choose the Western Skull. Thanks.